Blip is a kind of music site that looks like a micro-music platform, similar micro-blog Twitter but it is about music, and you can search and listen music. The site is simple, interface looks also like a micro-site, very easy to use (search and listening). 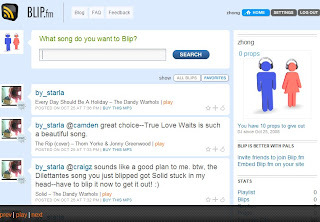 If you registered an account with Blip you can upload or link your favorite your music. Click play it will play a song, no fancy but useful and quickly. It is a good place for share music with other people.